There is an increasing interest in old horticultural plant cultivars and their products as natural and cultural heritage objects across the Europe as well in Latvia and Lithuania. Potential tourists in the Programme area are lost due to the lack of information and absence of developed routes. Potential horticultural heritage objects are not prepared for tourists’ needs. The overall objective of the project is to increase attractiveness and accessibility of old horticultural plant collections as cultural and natural heritage. The best experience and specific competences of research institutes, countryside tourism associations and museums from both countries will be combined for achievement of project aims. Project will develop a new tourism product – Heritage garden tour with 6 route itineraries. Tourism map of Heritage garden tour will be created, suitable for cycling and driving with relevant information: sites to visit, available services, including eating and accommodation. 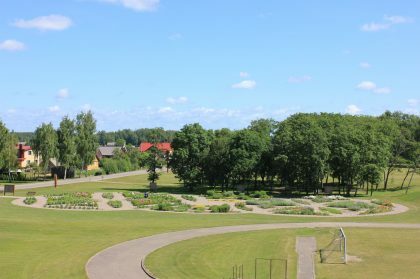 During the project, sustainable improvement of infrastructure of cultural and natural heritage objects will be performed and a historical orchard developed at Rundale Palace museum, attractive information for visitors established at the heritage fruit, vegetable and flowering plant collections of the Institutes of Horticulture in both countries. Enriched collections will serve recreational, educational and research purposes. Two brochures, a booklet and flyers will be prepared about project achievements and information on natural and cultural heritage objects of Latvia and Lithuania, their historical value showing the need of preservation of horticultural objects. A new tourist map has been issued that will take you on a journey through the historical and contemporary gardens of Latvia and Lithuania. 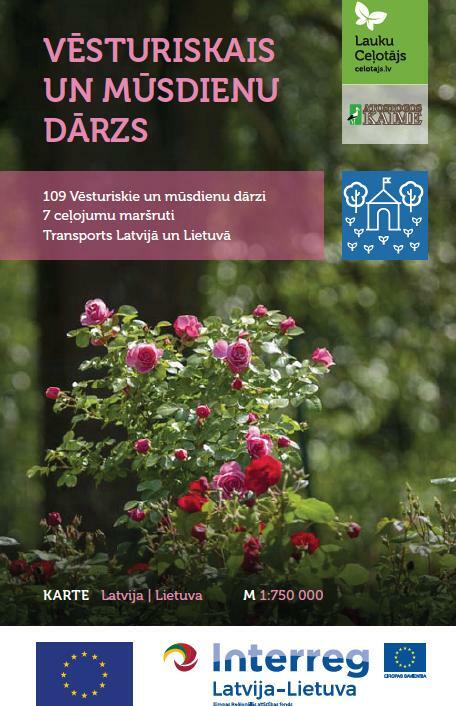 This map features 109 gardens that are open to visitors, 53 of them historical gardens which emphasis their values, as well as botanic gardens and collections of plants where you will learn about gardening traditions and history and see traditional types of fruits, vegetables, herbs, decorative trees, bushes and flowers in Latvia (Latgale, Kurzeme, Zemgale) and Lithuania (Aukštatija, Žemaitija). Included also several landscape gardens where you can get ideas for your garden design, as well as farms dealing with berry and fruit processing. The map also includes 7 tourist routes that will be useful for travel ideas during the garden season. The map is printed in 5 languages. Printed map is available in Lauku celotajs office Kalnciema street 40, Rīga, and in Lithuanian Rural tourism office Donelaičio street 2-201, Kaunas. On October 6 on workshop “Suitability of fruit and berry varieties for different types of processed product” the leading researcher of the Institute of Horticulture Dalija Segliņa hold a lecture about the biochemical content of fruit and berries, differences between varieties and it’s suitability for different types of processed product, including historical ones. Information about basic preparation technologies of candied fruits, raw material pre-treatment, granulation equipment, drying methods and equipment, also – the quality indicators and the factors influencing candied fruits. After the lecture, the participants got acquainted with the existing processing equipment of the Institute, as well as equipment used for the production of candied fruits. Media trip in Latvia was organized on 20th September and totally gathered 25 media representatives – from radio, social networks and printed media. During the trip visited open gardens and farms, where can get acquainted with horticultural traditions and history, and where can see the traditionally grown fruits, vegetables, herbs, ornamental trees, shrubs and flowers. 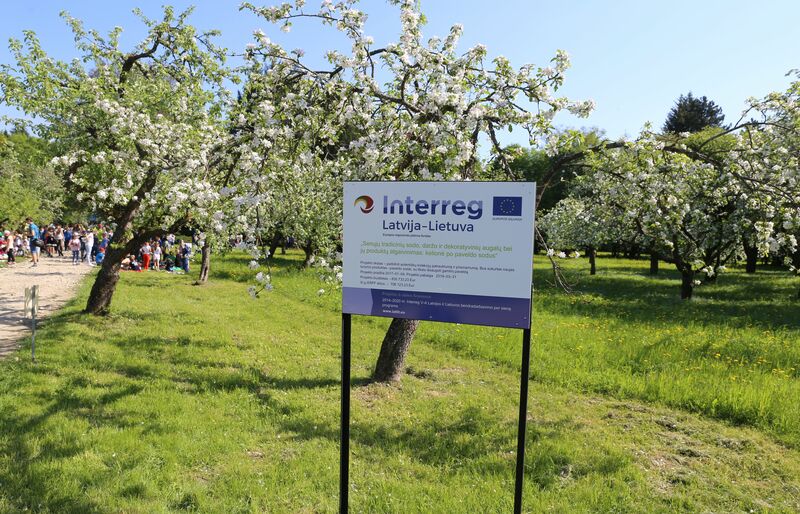 First stop was in Dobele Horticulture institute, where informed participants about the project activities, took a walk in the orchard to see modern and historical cultivars. Hosts in “Vilki” dendrarium introduced with rare varieties and showed their traditional farm orchard with old apple trees and vegetable garden. Last two objects were Berķenes and Blankenfeldes manor. In Berķene manor park and garden are not preserved, but in Blankenfelde visited orchard and tasted elderberry products that are made on the spot. 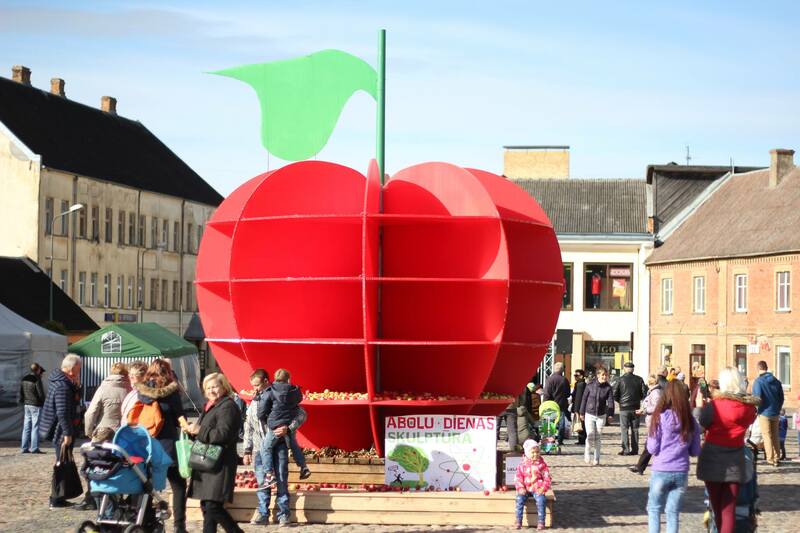 On October 6 we celebrated Latvia’s most “juiciest” autumn festival in Dobele – Apple Day. The visitors of the Apple Day could buy apples and other delicacies at the local producers’ market, compete in the chess game, escape the apple labyrinths and hit the apple target. During the day, visitors could also enjoy funny and attractive musical atmosphere, theater for children and mushroom soup with apple cream and other delicacies. At the Apple exhibition, you could see and taste only a small selection of about 600 apple varieties grown at the Institute. One of the most important events of the Apple day was the award of the Apple medal. This year it was awarded to Dr.agr. Edīte Kaufmane – leading researcher of the Institute of Horticulture. 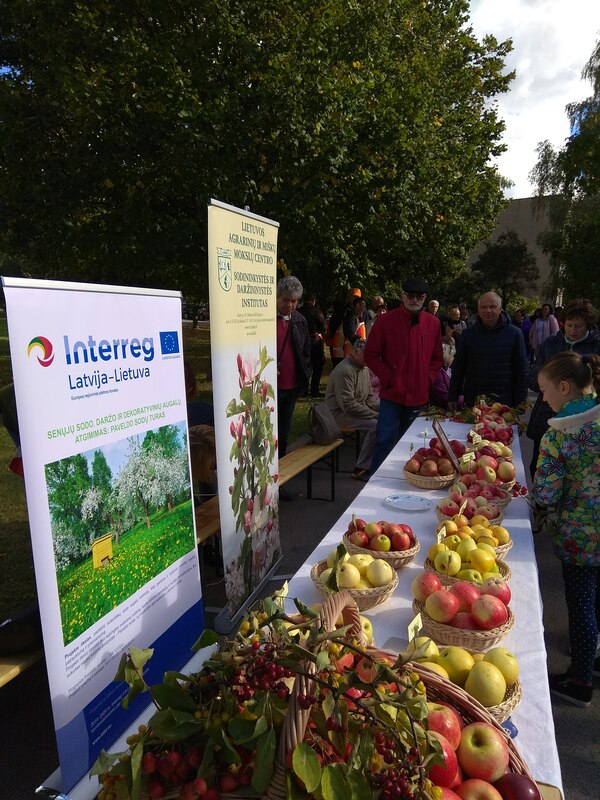 At the end of September, when the most of field works are done, traditional Apple day is organised in Babtai – the apple capital of Lithuania. Traditional apple pies, jams, apple cheese were presented to public as well apple photo exhibition, handcrafts, folk music and dances. 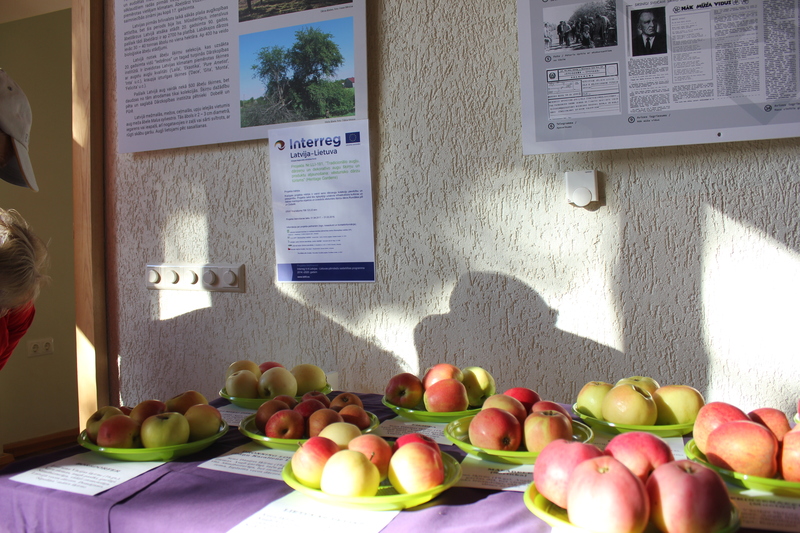 Heritage Gardens project presented old apple cultivars that are grown in Lithuania. It was possible not only to touch, to smell or to test apples. 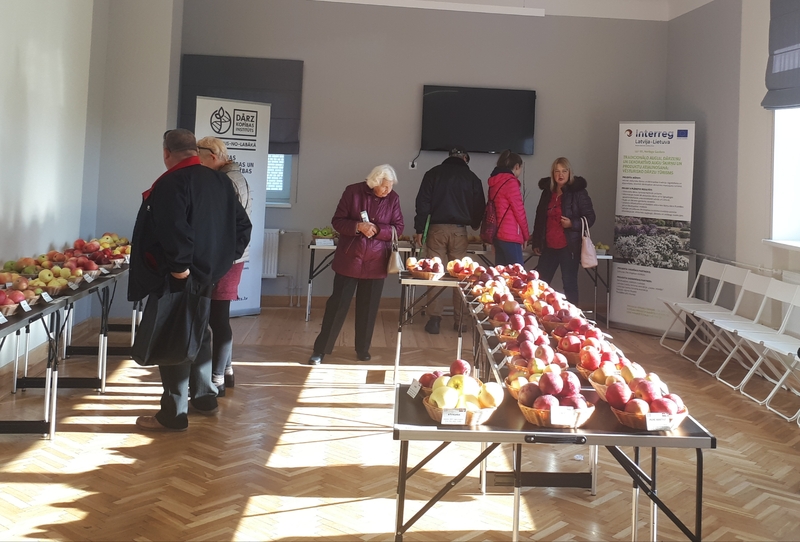 Scientists from the Institute of Horticulture told stories of introduction of these cultivars to Lithuania, explain the main features and benefits of each apple. 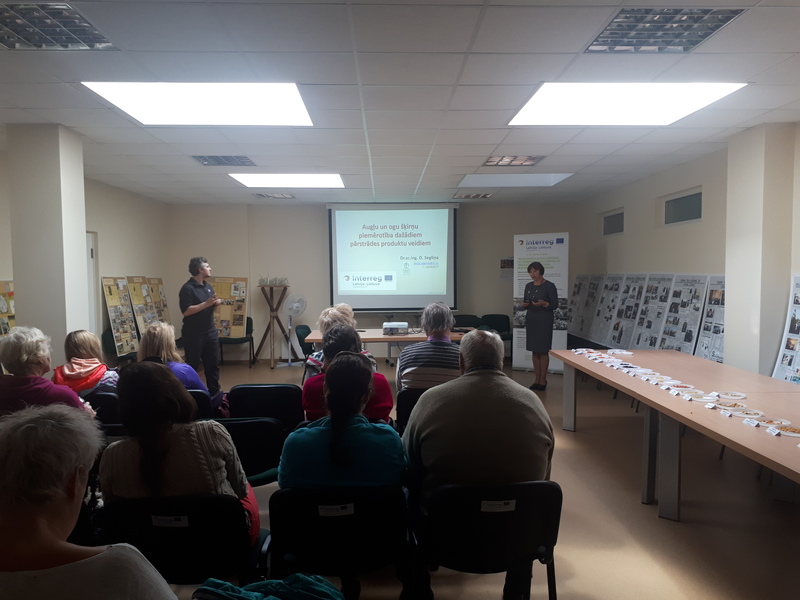 Project “HERITAGE GARDENS” (LLI – 181) 3 rd partner meeting and joint workshop were held on 10-11th of September in Mažeikiai district. The main issues were project management, coming report, possible changes in budget and communication activities. All the partners presented their progress in project – upcoming events and prepared material for the publications also shared the experiences and results of the past events, media trips. A big attention was dedicated to the communication work package. New communication requirements were presented, communication activities were reviewed and commented. Also we had discussions on communication activities for the next period (participation in fair Vakantiebeurs in Utrecht, the Netherlands and promotional seminar in Lithuania) and we agreed on the formats and concepts of these events. Date for the next project meeting was agreed. 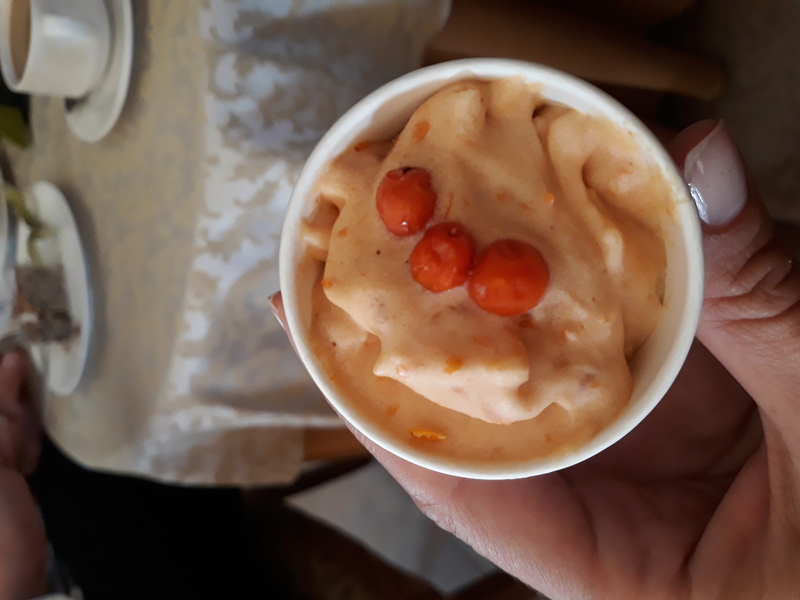 All the participants had a possibility to taste the revival of the old recipes – degustation of the ice-cream was organized by the Dobele institute. Next day we had a joint workshop and visited a few objects in Šiauliai district. 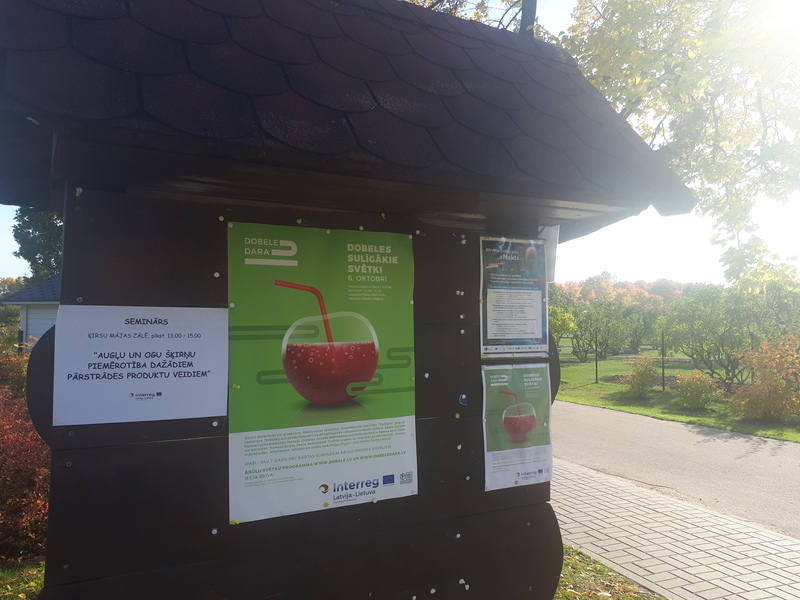 In Šiauliai botanical garden and also in Kurtuvėnai regional park our specialists in horticulture and tourism gave consultations and advices, how to improve their objects and make them more attractive to the visitors. Heritage plant collections in Naisiai village were visited too. 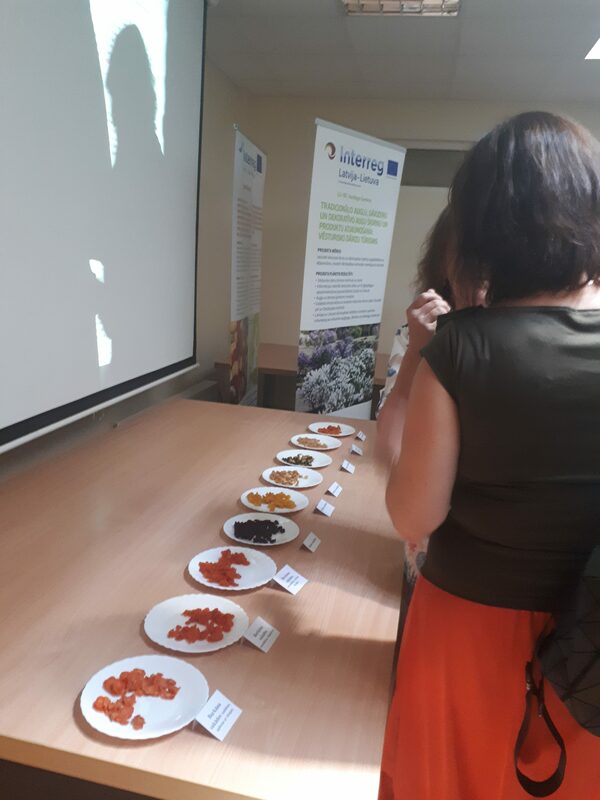 On the 24th Augusts at the Institute of Horticulture, Latvia University of Life Sciences and Technologies, a workshop “Candied fruits from vegetables and their preparation” was organised in the frame of the project “Revival of old traditional fruit, vegetable and ornamental plants and their products: Heritage Gardens Tour”. 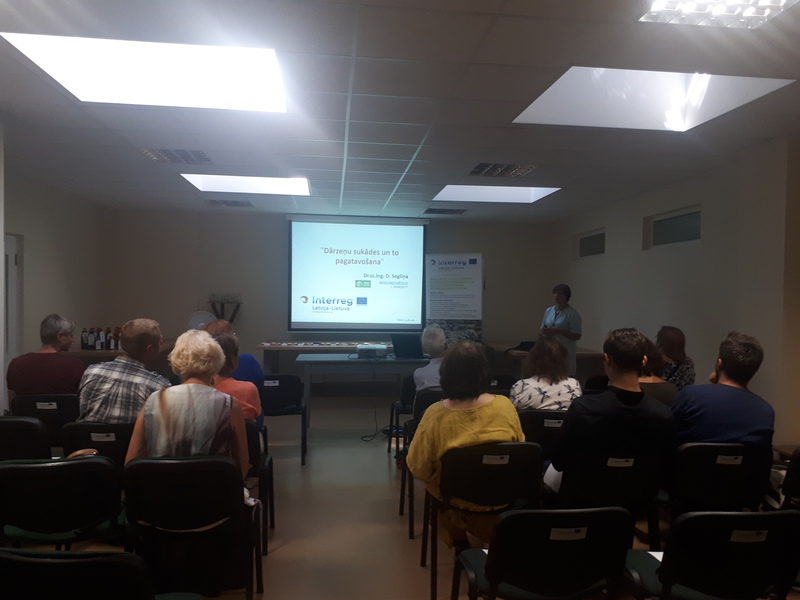 The leading researcher of the Institute of Horticulture Dalija Segliņa hold a lecture about the technologies and equipment of vegetable production, the quality indicators and the factors influencing them. As in any production process, also in the production of candied fruits, the main thing is to formulate what is the end product that you want to achieve. After the lecture the participants got acquainted with the existing processing equipment of the Institute, as well as equipment used for production of candied fruits. 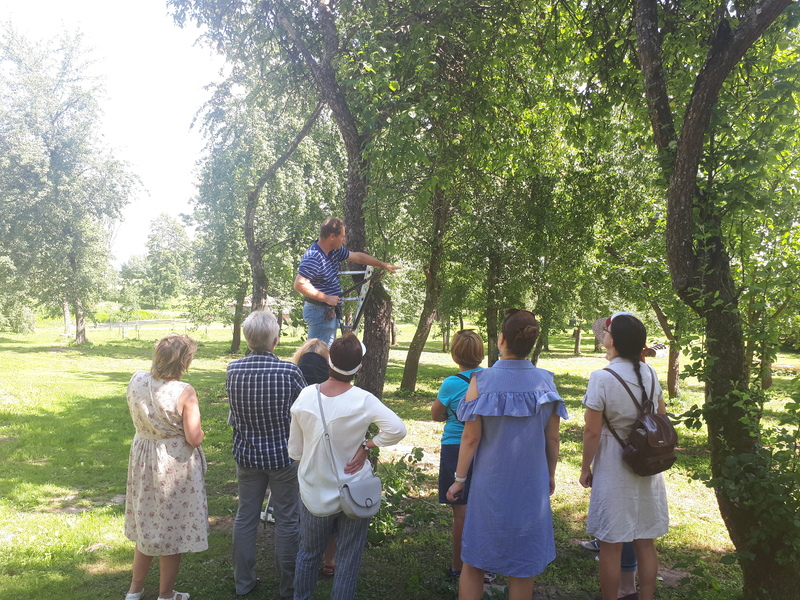 On the 1st of August the garden owners met in the Berķeneles Manor (Rainis House) for the fruit tree formation masterclass in the frame of the project “Revival of old traditional fruit, vegetable and ornamental plants and their products: Heritage Gardens Tour”. The leading researchers of the Institute of Horticulture, Latvia University of Life Sciences and Technologies, Edgars Rubauskis and Laila Ikase shared the theoretical and practical advice on the formation of various fruit trees. Participants of the masterclass had an opportunity to discover and find out lot of interesting things about apples, which served as a good example for attracting tourist. Manager of Rainis House has a lot of ideas and plans to implement! Hopefully, that everything will succeed! The masterclass on fruit tree formation for garden owners continued on the 7th of August in the farm “Vilki” in Jelgava Region, where the leading researchers of the Institute of Horticulture, Latvia University of Life Sciences and Technologies, Edgars Rubauskis and Laila Ikase shared the theoretical and practical advice on the formation of various fruit trees, also young and old fruit trees. Part of the old trees have their own special story that makes the farm more interesting to tourists. The younger generation is also actively involved in the farm work. The hosts have made their own brand, so that the larger groups of tourists can easily see and recognize them. Lot of attention is paid to farm’s product tasting, which is also interesting for tourists. 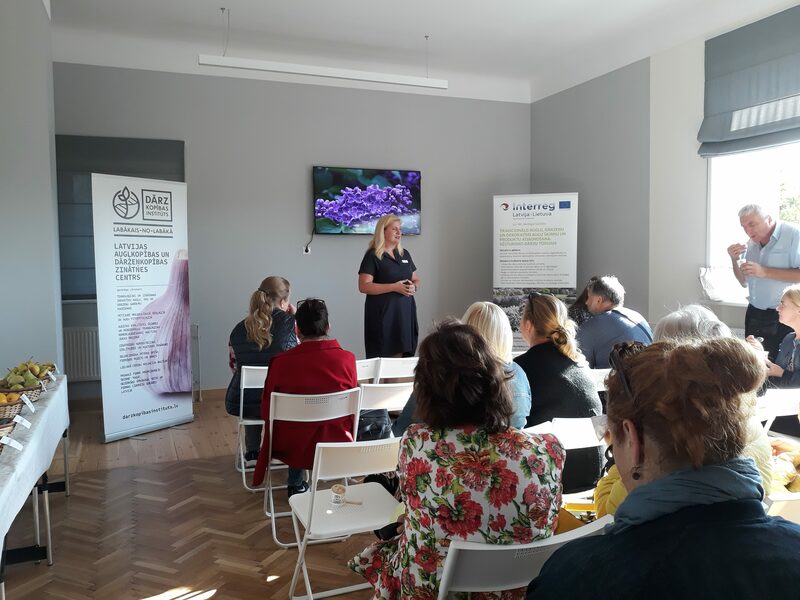 Within the the project HERITAGE GARDEN, on 15th May, 2018, Countryside tourism association of Lithuania organized media tour. During this tour 5 objects were visited by journalists and travel operators from 14 different media and travel companies. Press conference was organized in the Institute of Horticulture, where also plant collections were introduced. Survilai homestead presented the old garden, which was planted by the grandgrandfather of the owner and the barefoot pathway. Homestead of “Garsi tyla” (Load silence) told about their 100 years old garden with 150 trees and arranged the gourmet food from their farm. In museum of Obelynė the large collection of the trees were presented with interesting stories. The oldest apple tree also made a big impression for the participants. Heritage garden topic was new and interesting for the journalists and we hope that developed tourism product will allow to discover the old gardens and to know more about the old traditional breeds. 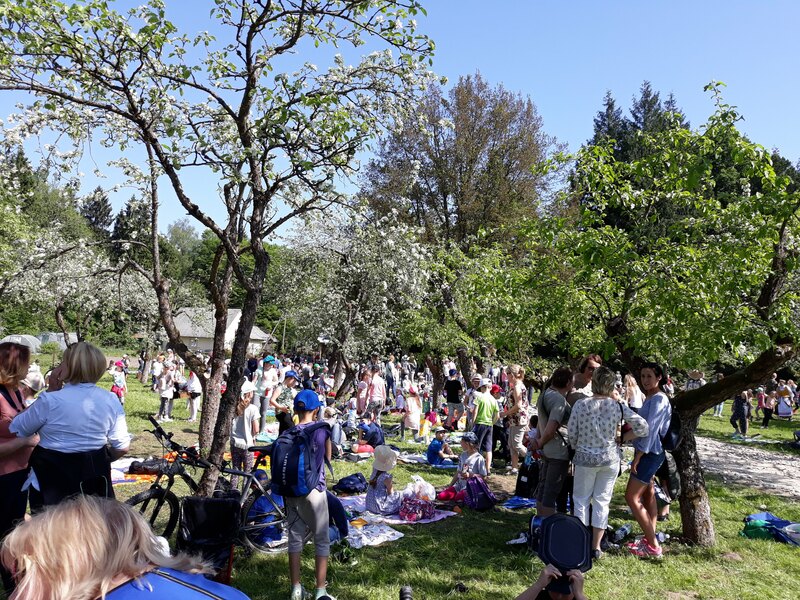 In the frame of Heritage Gardens project The Cuckoo Festival was organized on the 10th of May in Obelynės homestead – historical orchard and rich fruit and ornamental plant collection of famous scientist Tadas Ivanauskas. After opening of the festival, Kaunas District Museum director Zigmas Kalesinsas presented the project, the main aims, the works which is already done in Obelynė and the ones which will be done. The event gathered pupils from different Kaunas district schools, representatives from Kaunas District Municipality (approximately 700 visitors). During the event there was a presentation of different Lithuanian regions’ ethnographic and culinary heritage; outdoor kitchen; folk dances; folk rituals, games and competitions; crafts fair; presentation of Obelynė Homestead and heritage garden. martā Mazmežotnes muižā pulcējās lauku tūrisma uzņēmēji, lai tiktos Dārzkopības institūta rīkotajā meistarklasē, kas norisinājās projekta “Tradicionālo augļu, dārzeņu un dekoratīvo augu šķirņu un produktu atjaunošana: vēsturisko dārzu tūrisms” (Heritage Gardens, No. LLI-181) ietvaros. Dalībniekiem bija iespēja apskatīt Mazmežotnes muižu un muižas dārzu, kā arī uzklausīt praktiskus padomos par to, kā padarīt savu dārzu pievilcīgāku tūristiem. Dārzkopības institūta vadošā pētniece Līga Lepse iepazīstināja klātesošos ar padomiem dārzeņu audzēšanā un saglabāšanā, sniedzot ieskatu arī dārzeņkopības vēsturē un atklājot, kurā gadsimtā pie mums parādījušās dažādas dārzeņu sugas un kādas ir dažādu vēsturisko sugu galvenās audzēšanas prasības. Īpaši tika atgādināts, cik svarīgi ir sekot līdzi augsnes rādītājiem un par nepieciešamību veikt augsnes bioķīmiskās analīzes, lai pareizi uzlabotu un saglabātu augsnes auglību. Tāpat tika uzsvērts, ka nedrīkst aizmirst par augsekas ievērošanu, kur ļoti labu ietekmi sniedz tauriņziežu iekļaušana. Tika sniegti vēl daudzi citi vērtīgi ieteikumi par to, kam būtu jāpievērš uzmanība, lai izaudzētu labu un kvalitatīvu ražu, piemēram, laistīšanai, zaļmēslošanai, augu aizsardzībai. Savukārt vadošais pētnieks Edgars Rubauskis stāstīja par vainagu kopšanas principiem augļu dārzā, vispirms iepazīstinot ar materiāliem, kur iespējams atrast dažādu informāciju par augļaugu kultūrām, lai veiksmīgi pārvaldītu savus augļu dārzus un izveidotu tos iespējami pievilcīgākus tūristiem. E. Rubauskis uzsvēra, ka, sākot veidot augļu kokus, vispirms ir nepieciešams izprast mērķi, kādēļ to ir nepieciešams darīt – agras, lielas un labas kvalitātes ražas ieguvei, kā arī, lai dārzs būtu viegli kopjams un baudāms apmeklētājiem. Viens no galvenajiem priekšnosacījumiem augļu koku vainagu veidošanā ir, lai augļiem piekļūst saules gaisma. Tāpat E. Rubauskis iepazīstināja ar dažādu augļu koku veidošanas pamatprincipiem, kā arī sniedza praktiskus padomus, kā veidot vecu augļu koku vainagus. Projekta ietvaros plānotas vēl trīs meistarklases dažādos tūrisma objektos, zemnieku saimniecībās, lai sniegtu praktiskus padomus dārzu kopšanā un augļu koku veidošanā. Projekts „Tradicionālo augļu, dārzeņu un dekoratīvo augu šķirņu un produktu atjaunošana: vēsturisko dārzu tūrisms” tiek īstenots Interreg Latvijas – Lietuvas pārrobežu sadarbības programmas 2014. – 2020. gadam ietvaros ar Eiropas reģionālā attīstības fonda (ERAF) atbalstu. Kopējais projekta budžets visiem iesaistītajiem projekta partneriem ir 830 733.23 eiro, no tā 706 123.23 eiro ERAF finansējums. Projektu īsteno 6 partneri – Lietuvas lauksaimniecības un mežsaimniecības pētniecības centra Dārzkopības institūts, Dārzkopības institūts (Latvija), Latvijas Lauku tūrisma asociācija “Lauku ceļotājs”, Lietuvas lauku tūrisma asociācija, Kauņas rajona muzejs un Rundāles pils muzejs. Šis raksts ir sagatavots ar Eiropas Savienības finansiālo atbalstu. Par tā saturu pilnībā atbild Dārzkopības institūts, un tas nekādos apstākļos nav uzskatāms par Eiropas Savienības oficiālo nostāju. Kopš 2017. gada pavasara Dārzkopības institūts Dobelē kopīgi ar 5 partneriem sācis īstenot projektu “Tradicionālo augļu, dārzeņu un dekoratīvo augu šķirņu un produktu atjaunošana: vēsturisko dārzu tūrisms”, kura ietvaros 2017. gadā jau ir apsekoti vēsturiskie dārzi Latvijā un sākta vēsturisko dārzu maršrutu izstrāde tūristiem. Lai apkopotu līdz šim projektā paveikto un diskutētu par turpmāko rīcību, 20. februārī notika projekta partneru no Latvijas un Lietuvas tikšanās. Gan Latvijas, gan Lietuvas kolēģi ir noslēguši vēsturisku dārzu apsekojumus savās valstīs un apkopo iegūto informāciju. Tikšanās laikā tika diskutēts par dārzu atlases principiem tūrisma maršruta izstrādē un analizēti dažādu dārzu piemēri. Kā atklāja institūta zinātnieki, ļoti bieži dārzā ir atsevišķi unikāli koki, kas ir vērtība no augļkopības zinātnes viedokļa, bet tiem trūkst tūrisma vērtības, jo dārzs nav izveidots kā tūrisma produkts. Zinātnieki un tūrisma asociāciju pārstāvji vienojās, ka maršruta izstrādē vērība tiks pievērsta citiem tūrisma objektiem, kas atrodas dārza tuvumā. Turklāt iekļaujot ne tikai interesantus augļu koku dārzus, bet arī garšaugus un puķes, kas arī varētu būt pievilcīgas tūristiem. Dārzu apsekojuma laikā dārzu īpašnieki izrādījuši interesi iegūt apsekojuma rezultātus par savu dārzu, līdz ar to projekta partneri vienojās, ka sniegs rekomendācijas un dārza izvērtējumu katram īpašniekam, jo bieži vien viņus interesē arī dārza zinātniskā vērtība. Turklāt Dārzkopības institūta direktore Inese Ebele skaidroja, ka nepieciešams papildināt rekomendāciju sadaļu ar informāciju, kas varētu būt saistoša objektu īpašniekiem, lai viņi zinātu, kā uzturēt savu dārzu – praktiski padomi kopšanā, uzturēšanā, veco šķirņu saglabāšanā un sēklu ievākšanā, kas būs vērtīgs ieguvums ne tikai pašiem īpašniekiem, bet arī tūristiem, kuri apmeklēs dārzus. Divu gadu laikā plānots attīstīt jaunu tūrisma produktu – maršrutu. Lai to īstenotu, mūsdienu vajadzībām tiks adaptēti tradicionālie augu un dārzeņu pārstrādes produkti, kuru demonstrējumi bagātinās maršrutu un palīdzēs mazināt tūrisma sezonalitāti. 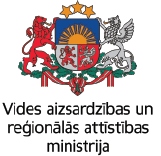 Tāpat Latvijas un Lietuvas partneri izstrādās vēsturisko dārzu kā tūrisma objekta vadlīnijas, vēsturisko dārzu maršruta karti velo un autobraucējiem, informatīvās norādes un citus informatīvos materiālus. 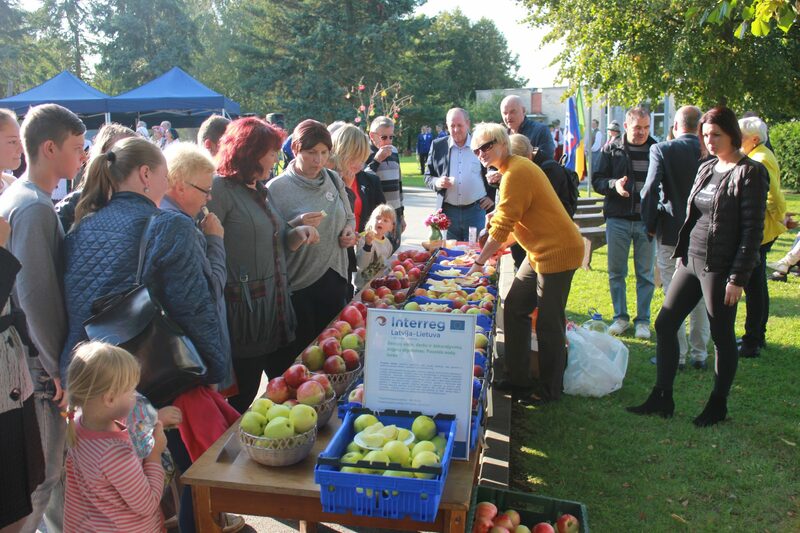 Apple day as usually was organized in Dobele Historical Market Square on October 7. There were different and exciting apple attractions, visitors could also see the exhibition of fruits, processed products and had the opportunity to visit the apple gardens at the Institute of Horticulture. One of the most important events of the Apple day was the award of the Apple medal. This year it was awarded to Dr.agr. Edgars Rubauskis – leading researcher of Institute of Horticulture who has been working in the Institute for 20 years for his achievements in fruit-growing. 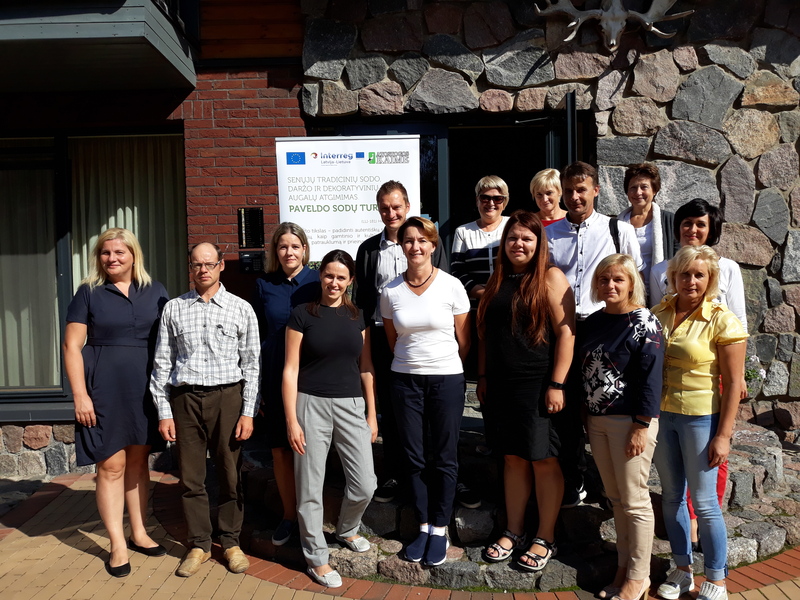 The 1st Project partner meeting was organized in Latvia on Sept. 27-28. All partners presented their activities and implementation progress. Project partners discussed on Communication plan, Tourism product definition, content and design of publications. Project coordinator Darius Kviklys pointed on actualities of progress reporting. During the meeting heritage plants collections were visited at the Institute of Horticulture, Vilke arboretum, Rundale and Brukna manors. 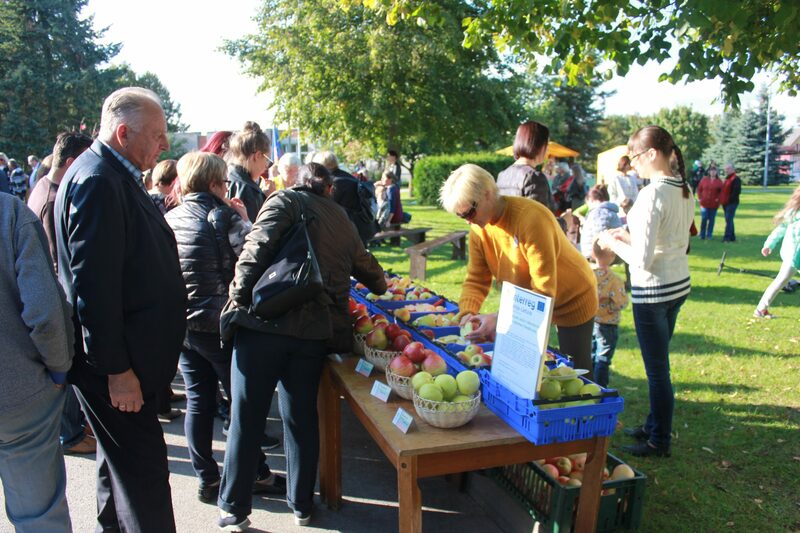 Autumn fiesta “Obuolinės” (“Apple day”) was organised in Babtai on Sept.16th. This year it was international with numerous guests from Latvia. Besides various activities, folk music, dances, and songs Heritage Garden project presented old apple cultivars and products made from them. Around 250 people visited “delicious exhibition” of Heritage Gardens. Historical fruit tree cultivars are carefully selected to renew the orchard at Tāšu (Telsen) estate in Grobiņa region, Latvia. The estate flourished in the 18th century, and the orchard pleased the inhabitants of the estate with beautiful apple tree blossoms in spring and fruit harvest in autumn. 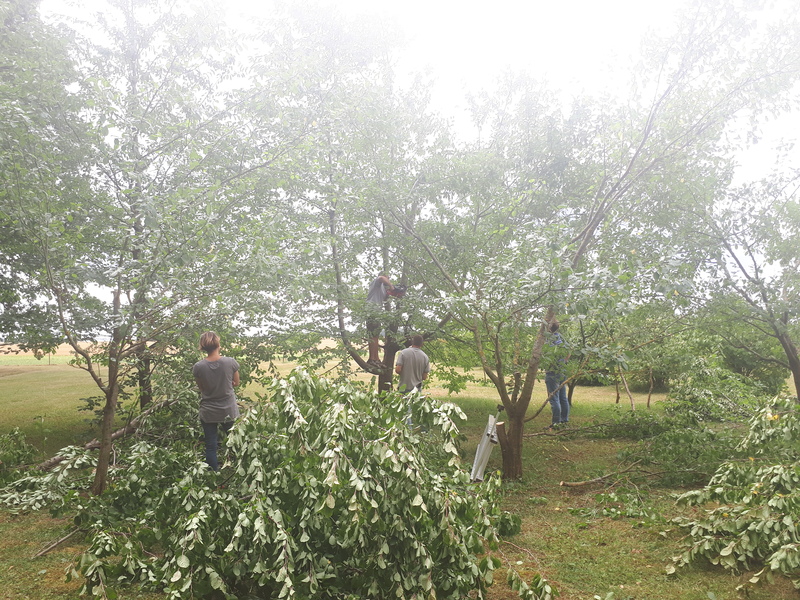 At present, the orchard is in the process of renovation. The layout of pathways is planned to follow the principles and contour lines of a regular Baroque garden park as found in garden archaeology. Lots of effort and consultation with professional tree breeders is put in search for the historical tree varieties to reproduce the garden’s authentic features. 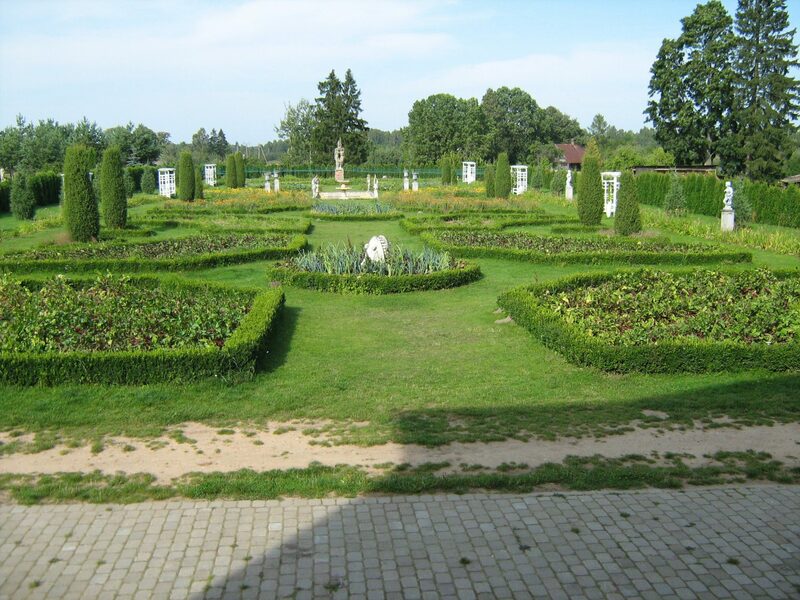 On prior arrangement, visitors will spend 1-2 hour walking through the estate building, the garden and the park while listening to fascinating stories about experiences from historical gardens in Europe and their replication in Latvia. 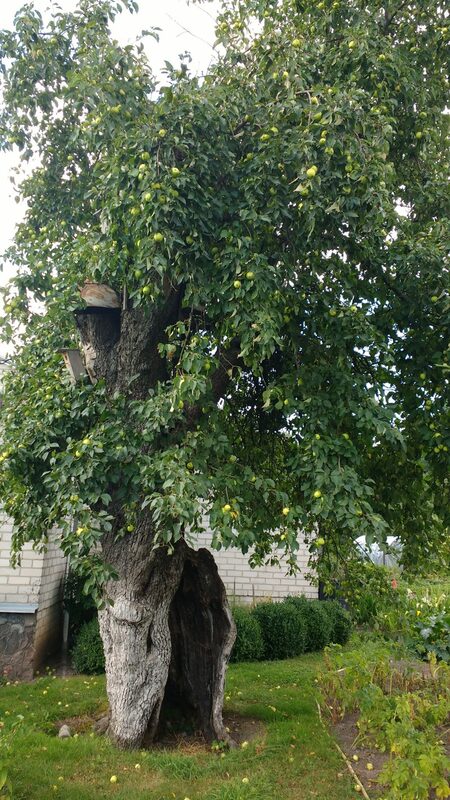 More than 300-hundred-year-old apple tree grows almost in Kaunas city, in nearby situated Kazliškiai. This year it is full in apples, unfortunately fruits are quite bitter like a most of wild apple trees propagated by seeds. A big hollow is in ancient tree stem, but shoots and leaves of the old apple look healthy and give feeling for it’s nice future and attraction of visitors. Before camping – remove apples! 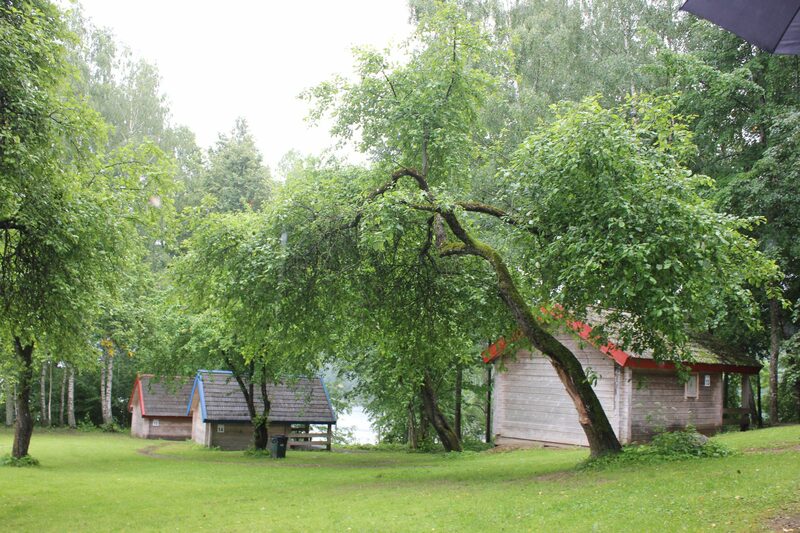 Unique island in the lake of Grabuostas offers for visitors camping and excellent relax surrounded by hundreds of apple trees, collected and planted by professor Šivickas in 1930’s. Most of trees are still in excellent shape and bear delicious fruits. Not only apple trees could be found in Apple island. There are ancient cherries and even currants planted before Second World War. By the help of the Heritage Gardens project partners and Apple island managers special alley will be created for Heritage purposes. Dar daugiau įdomių faktų, datų ir užmirštų unikalių sodų atskleis pradėtas vykdyti projektas „Senųjų sodo, daržo ir dekoratyvinių augalų atgimimas: Paveldo sodų turas“, kurio pagrindinis tikslas – padidinti autentiškų sodo augalų kolekcijų, kaip gamtinio ir kultūrinio paveldo objektų, patrauklumą ir prieinamumą. 2014–2020 m. Interreg V-A Latvijos ir Lietuvos bendradarbiavimo per sieną programos projekto biudžetas – 830 733 Eur, iš jo Europos regioninės plėtros fondo bendrasis finansavimas – 706 123 Eur. Projekto pradžia ir pabaiga: 2017.04.03 – 2019.03.31. Projektā „Tradicionālo augļu, dārzeņu un dekoratīvo augu šķirņu atjaunošana: vēsturisko dārzu tūrisms” jeb saīsināti – „Vēsturiskie dārzi tūrismā”, apvienojusies dārzkopības un tūrisma profesionāļu komanda – Latvijas un Lietuvas dārzkopības institūti, muzeji un lauku tūrisma asociācijas, lai kopīgiem spēkiem radītu jaunu, uz vēsturisko dārzu vērtībām balstītu tūrisma piedāvājumu. Kopīgais mērķis ir izcelt dārzkopības tradīcijas un iesaistīt tūrisma piedāvājumā dārzus, kuros tiek audzētas tradicionāli Latvijas un Lietuvas dārzos sastopamās, kā arī mūsu dārzkopju selekcionētās augļu, dārzeņu, garšaugu un puķu šķirnes. Šajā projektā vēlamies panākt, lai selekcionāri un dārzkopji atver savus dārzus apmeklētājiem un parāda mūsu vietējo, vēsturisko šķirņu priekšrocības un labās īpašības. Projekts tiek realizēts Interreg Latvijas – Lietuvas pārrobežu sadarbības programmas 2014. – 2020. gadam ietvaros no Eiropas reģionālā attīstības fonda (ERAF). Kopējais projekta budžets visiem iesaistītajiem projekta partneriem (6 partneri) ir 830 733.23 EURO, no tā 706 123.23 EURO ERAF finansējums. Projektā dārzkopības un tūrisma speciālisti apsekos dārzus, lai to saimniekiem palīdzētu ar konsultācijām par vēsturisko šķirņu saglabāšanu un stādījumu kopšanu, kā arī par sava dārza sagatavošanu apmeklētāju uzņemšanai. Kā paraugs Rundāles pils vēstures muzejā tiks izveidots vēsturiskais dārzs, apmeklētājiem saistošu informāciju piedāvās arī Latvijas un Lietuvas dārzkopības institūtu dārzi ar plašām seno augļu koku, dārzeņu un ziedu šķirņu kolekcijām. Taps vairāki mārketinga izdevumi ar šķirņu aprakstiem, to audzēšanas tradīcijām Latvijā un Lietuvā, ražas pielietojumu dažādās mūsdienīgās ēdienu un dzērienu receptēs. Lai popularizētu vēsturiskos dārzus, tie tiks apvienoti sešos tematiskos tūrisma maršrutos. Tiks izdota īpaša vēsturisko dārzu karte ar dārzu aprakstiem, saimnieku konktaktinformāciju, vēsturisko dārzu apceļošanas maršrutiem, kā arī naktsmītnēm un citiem pakalpojumiem, kas nepieciešami dārzu apceļotājiem. Latvijas un Lietuvas lauku tūrisma asociācijas veidos īpašas vēsturiskajiem dārziem veltītas sadaļas savās mājas lapās. Šobrīd projektā tiek apzināti dārzi un aicināti pieteikties sadarbībai to saimnieki. Vasarā plānota dārzu apsekošana, ko veiks gan dārzkopības, gan mārketinga partneri projektā, lai sagatavotu dārzus apmeklētājiem un informāciju mārketinga materiāliem. Projekta partneri: Lietuvas dārzkopības institūts, Latvijas Lauku tūrisma asociācija „Lauku ceļotājs”, Dobeles dārzkopības institūts, Rundāles pils muzejs, Kauņas rajona muzejs, Lietuvas Lauku tūrisma asociācija. Implementing project LLI-181 Heritage gardens the Cuckoo Festival was organized in Obelynės homestead. The event gathered youth from different Kaunas District schools, guest from other regions (approximately 500 visitors). During the event there was a presentation of different Lithuanian regions’ ethnographic and culinary heritage; outdoor kitchen (guests from Jonas Vitkus Engineering Battalion); folk dances; flower crown island; folk rituals, games and competitions; crafts fair; brain battle “Ethnographic Regions and National Costume”. First inspections of heritage objects took place in June month. 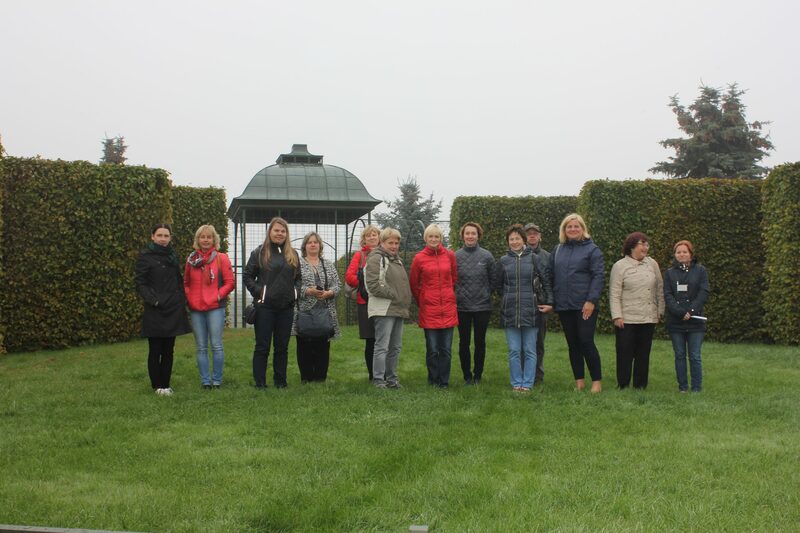 Team of Lithuanian horticulture experts from Institute of Horticulture visited heritage vegetable and traditional ornamental garden plant collections in Šiauliai and Klaipėda Botanical gardens, Balt grasses museum in Naisiai village. Proper management, excellent idea of presentation of old traditional plants let them include into Heritage Gardens Tour. Master class "Fruit tree formation in farm "Vilki"
Workshop "Candied fruits from vegetables and their preparation".